� 2008 International Food and Agribusiness Management Association (IAMA). All rights reserved. 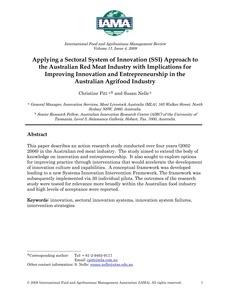 This paper describes an action research study conducted over four years (2002-2006) in the Australian red meat industry. The study aimed to extend the body of knowledge on innovation and entrepreneurship. It also sought to explore options for improving practice through interventions that would accelerate the development of innovation culture and capabilities. A conceptual framework was developed leading to a new Systems Innovation Intervention Framework. The framework was subsequently implemented via 30 individual pilots. The outcomes of the research study were tested for relevance more broadly within the Australian food industry and high levels of acceptance were reported.